A concept of what future redevelopment in the Smith/Dodd area could look like with realigned streets. 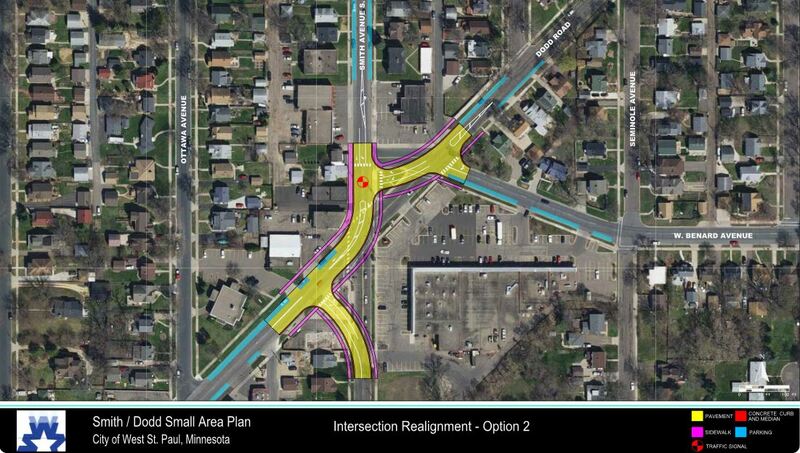 As discussed in an earlier post, an advisory committee (including yours truly) has been meeting over the spring/summer to discuss possible future realignment of the Smith/Dodd intersection. This group consists of residents, business owners and other stakeholders. The group has narrowed down the options to three basic concepts, and the city is planning to host an open house on August 10 from 5-7 p.m. at Doddway shopping center, in the former salon space next to Snap Fitness. At present there are three basic designs moving forward (this attachment, which was distributed to the city council, includes four but Option 1 has been eliminated at this point for a number of obvious reasons). Please bear in mind that these are just concepts and are not final plans. There is currently no estimate of what any of these options would cost because – once again – these are only design concepts and not plans. City staff have ballparked the entire project in the $2-$3 million range, depending on right-of-way acquisitions and other costs. The city already owns the former repair shop property on the southwest corner of the intersection. Also any recaptured land will likely be turned into commercial property or public open space. 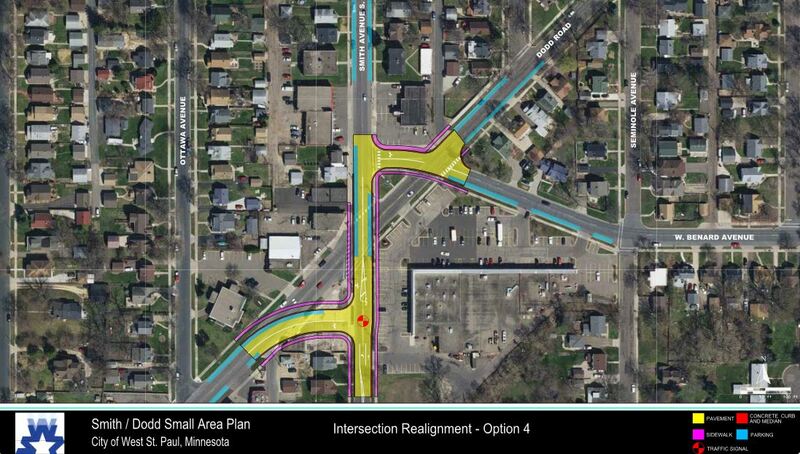 Another important caveat – this realignment will not be part of the upcoming MnDOT reconstruction of Highway 149. This is a separate city project that is currently not funded, and there is no firm timetable for construction. 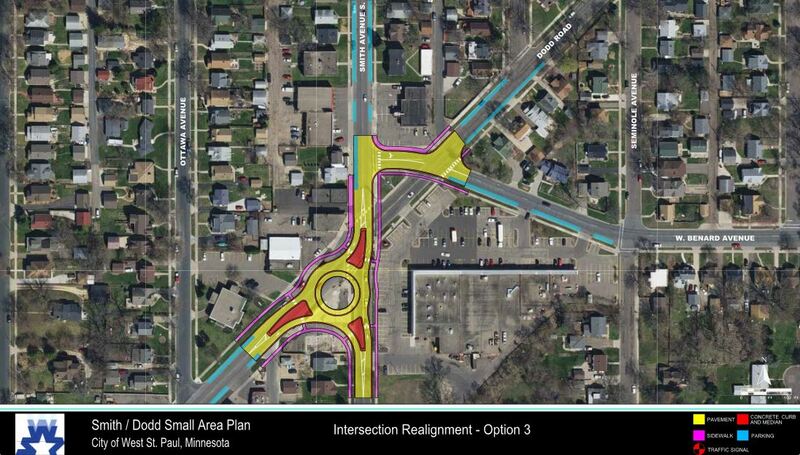 Under the MnDOT project there will be no improvement to the intersection beyond bringing sidewalks and ramps into basic ADA compliance. So! If you want to see a safer, walkable and more vibrant Smith Avenue, now is the time to speak up. Having a preference of one design over another is useful information, but be sure to tell your city council representatives what you want to see prioritized as the project moves forward.